Happy 5th Birthday, Giving What We Can! Giving What We Can recently celebrated its 5th birthday. It’s not much of a party if no-one external congratulates you, so here we go: Happy Birthday, GWWC! 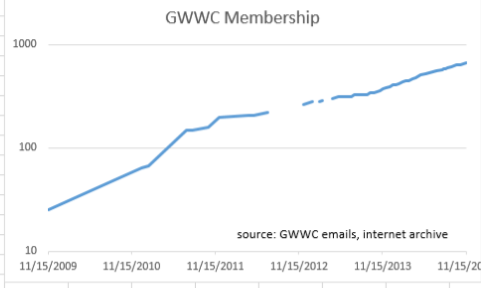 Putting the same chart on a log scale, we can see that GWWC have actually done a reasonably good job of sustaining exponential growth. 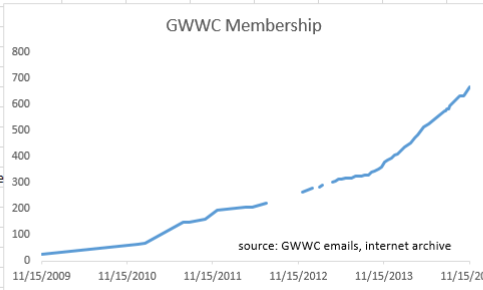 Fitting a line of best fit to the chart, I estimate GWWC’s membership is growing 73.1% a year. Assuming 2% population growth, it will take just 30.25 years before all the world’s population are GWWC members. Taking over the world by the time I’m 58 sounds like pretty good going! Happy Birthday, Giving What We Can! The Giving What We Can facebook group recently linked to a Washington Post article called ‘The long and ugly tradition of treating Africa as a dirty, diseased place.’ GWWC didn’t actually write the piece, but they did share it, and described it as ‘a warranted critique’, so we’ll assume they basically agree with the contents. The article had many interesting parts on Ebola, where they said basically exactly what you would expect them to say on the basis of their political views. But I’m not an expert on ebola, so I shan’t address that. They have a section on phrenology, where they attack the idea that ‘the size, shape and other physical characteristics of a person’s skull determine that individual’s intelligence.’ Well-known example of scientific misconduct notwithstanding, in truth it appears that skull size does positively correlate with intelligence.. Perhaps one could excuse Seay and Dionne (the authors) by saying that correlation is not the same as determination – there are still clever people with small heads, and idiots with big heads. But at the very least they were extremely misleading. But the really interesting thing is the accusation that westerns have unfairly portrayed Africa as being a ‘diseased place’. Strangely, nowhere in the article do the authors actually argue that Africa does not suffer from a heavy burden of disease. Perhaps this is one of those things that are wrong to say, even though they’re true? GWWC also recommends Deworm the World, which also operates in Africa. As does Project Healthy Children, another GWWC top pick. And SCI, a long-standing GWWC favorite, only operates in Africa. Why does GWWC recommend these charities? Because they tackle diseases that are very cheap to treat, so we can easily do a lot of good by funding their treatments. They’re so cheap that they’ve been irradicated from western countries. So GWWC should be well aware that Africa suffers from many diseases unknown in the west. Indeed, much of GWWC’s public relations work involves educating people about the opportunity for improvement these diseases represent. GWWC spends a lot of time talking about diseases prevalent in Africa, but absent in the west. So isn’t GWWC basically guilty of representing Africa as a ‘diseased place’? Sure, GWWC could argue that there’s nothing wrong with saying this. It is, after all, true. But they why are we representing the Washington Post’s article as ‘warranted’?